Complete horror and mourning have remained in the Chibok community in Nigeria since April 13th, the day suspected members of Boko Haraman extremist group that is located primarily in Northern Nigeria attacked a secondary school, and then herded and kidnapped nearly 300 female students. Amid this great tragedy, we know God is at work. Millions took to different social media platforms, to express their opposition to these hateful actions, proving that numerous people from around the globe cared about what happened to these girls. Hashtags like #BringOurGirlsBack aided in directing the world’s attention to this situation. We asked you in a previous blog post to join with us in sending prayers and encouragement to the families of these girls. As we saw the messages rolling in, we could not wait to deliver them to the families! An Open Doors worker recently visited families of the 200+ Chibok girls who remain missing six weeks after their abduction. The aim of the visit was to encourage the parents and to deliver the thousands of prayer messages that we have received for them from Christians around the world so far. Our colleague was deeply touched to see the effects of the pain on the parents. “What they are going through is unimaginable. Many we met were simply too broken to say much at all. They just cried. Clearly the pressure is taking its toll.” Local media reported that on May 22nd, one father of eight children, whose two daughters were abducted, died of a heart attack. 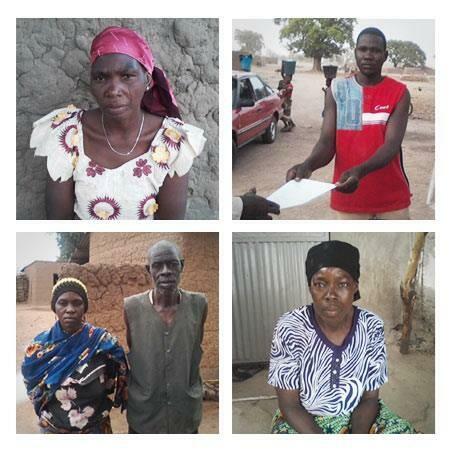 He is the second Chibok parent to have died under the pressure of the situation. From a conversation with the parents and some of the girls that managed to escape, we were able to confirm that on Sunday, April 13th, 275 school girls reported to the Chibok Government Secondary School to take an exam. At about 11pm that Sunday night, armed Boko Haram insurgents arrived and broke through the school area. They also burned the administration block and classroom blocks. Although the parents we met seem dazed and overwhelmed, they expressed their thanks. “We feel bad, but are thankful to God for the global concern the kidnapping is receiving.” “Even if they do not fully understand it now, we pray that as the parents page through the many messages they are receiving, they would see the support from brothers and sisters around the world and be encouraged. We know that each of the messages we receive comes with a sincere plea to God to sustain the girls and the parents, to fulfil His purposes in their lives and to bring them back together again in His time. Please don’t stop praying,” commented an Open Doors team member. Please continue to pray that God, in His grace, would enable Nigerian forces, with the assistance from others, to locate the girls. Freeing them will be a very delicate operation- pray for God’s wisdom.